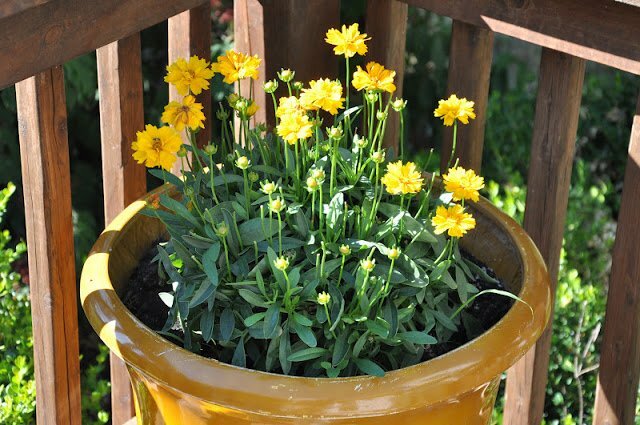 We were blessed with some great big golden-colored pots this spring. 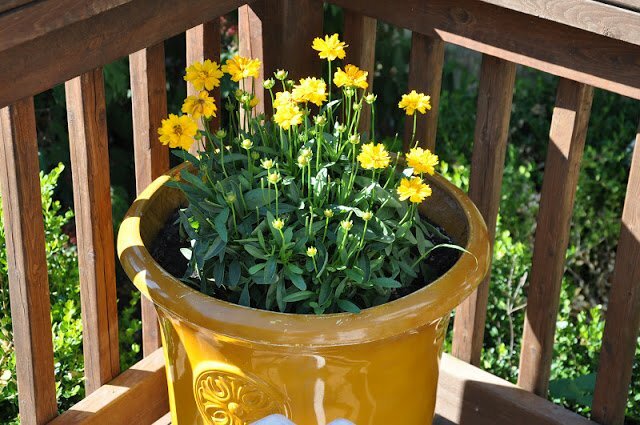 I wanted to put them on the front deck and fill them with an inexpensive, but pretty, flowering plant. I found some golden daisy looking plants called, Tickseed. Their tag said they were drought friendly and repel deer and ticks, hence the name. I tried to remember what the experts tell you, “Don’t purchases a plant that is already in full bloom. 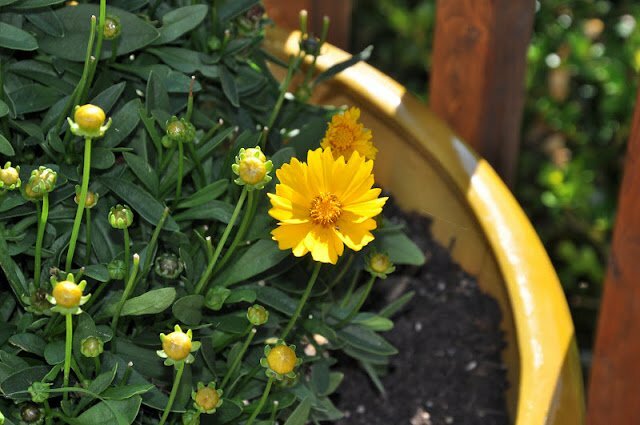 Look for some that haven’t yet bloomed all the way, so you can enjoy the blooms to come.” I picked two plants that had some blossoms but also had a lot of buds that hadn’t bloomed yet. I bought some new potting soil (only one bag which was not nearly enough for these huge pots). So I added some dirt, from the dirt pile out back, and some old potting soil from last year (that was really dried out). I hoped they would be okay, as I am not much of a green thumb. They did okay for awhile and then the blossoms dried out and turned brown. So much for drought-friendly I thought. I deduced that I had either: over-watered, under-watered, planted too shallow, didn’t put rocks in the bottom to help them drain, or the soil was not rich enough. I was pretty bummed. What was I going to do with two dead plants in these lovely pots? I thought about throwing the plants out and just leaving the pots empty. Then a friend suggested I deadhead them and they might bloom again. I had my doubts, but tried it anyway. And guess what, within a week they bloomed again! This time even more beautifully (these pictures are from the second bloom). I was so excited. What appeared hopeless and dead was preparing to burst forth with life. What if I would have given up and thrown them away? The Tickseed reminds me of this journey of waiting we are on. It is tempting to be hopeless, to want to throw in the towel, to retreat- with nothing tangible in sight. But, He has called, and we have answered and we will stand in the waiting. We will hope in the midst of the fog. Not by our strength or resolve, but by His supernatural upholding. When I was in college I was in a season of waiting too. Waiting for hubby. Where was he? What did he look like? When would God cross our paths? I was determined to find him. But, alas, it was outside of my control. Sometimes I felt like he must be just around the corner, because I so wanted to meet him, to know him- to finally be with him. But the wait lasted longer than I planned, or wanted, but when it did happen, it was natural, right, and worth the wait. We’ve had bumps and bruises, failures and successes; grace carrying. 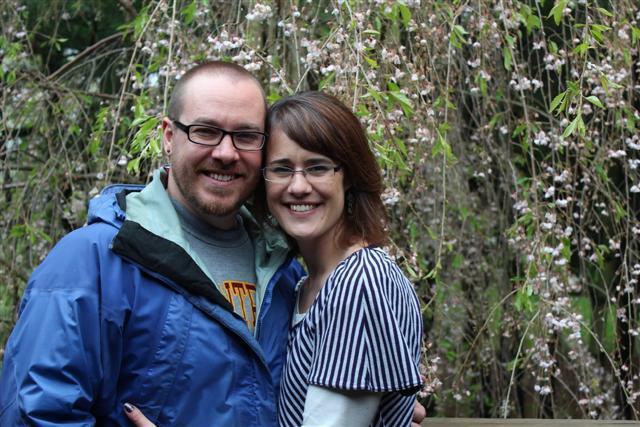 As we get ready to celebrate 11 years of marriage, God’s faithfulness, on Saturday, I smile at how we’ve grown and how much growing we’ve yet to do. Today, I am remembering the tickseed and the journey to hubby. I am glad I didn’t give up when things looked bleak. I don’t want to do that now. I don’t want to regret, to doubt. 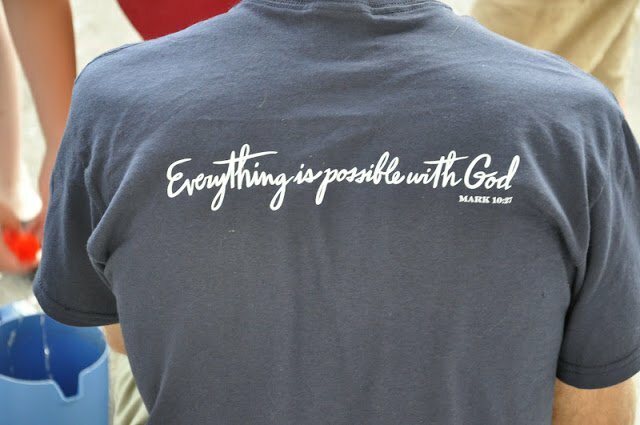 There is no guarantee how things will turn out, with the adoption, with life; but He is able to do the impossible (Mark 10:27). So, I am asking God to help us to wait with more grace, with more dignity, for Baby #4. To be real, but to allow the wait to help our faith to soar; to fly. Through this “official” year of waiting, I have learned that I don’t know as much as I thought, but I know the One who knows all (and long to know Him better). I need Him to hold me together. I need His wisdom more than I realized. I am NOT “in the know” many times (like I want to be). But, He is trustworthy. He sees, He knows, He holds and He is able. Able to orchestrate, without my help. Able to control, without me. I need to be done with my predictions about when Baby will come. The gap widens between the kids. Our prayer, may we, by His grace and power, be found faithful; faithful stewards that point to Him. Yellow tickseed blossoms that grow toward sun, and live, even in drought; repelling that which threatens to destroy. That die, in order to really thrive.